KickStart has empowered a total of 1.2 million people to lift themselves out of poverty, and expanded our focus to 16 countries across Africa. The mindset and practice of approaching farming as a dynamic business through consistent, market-led production. Agropreneurship training imparts the agronomic and financial skill sets farmers need to start and grow their own life-changing enterprises. 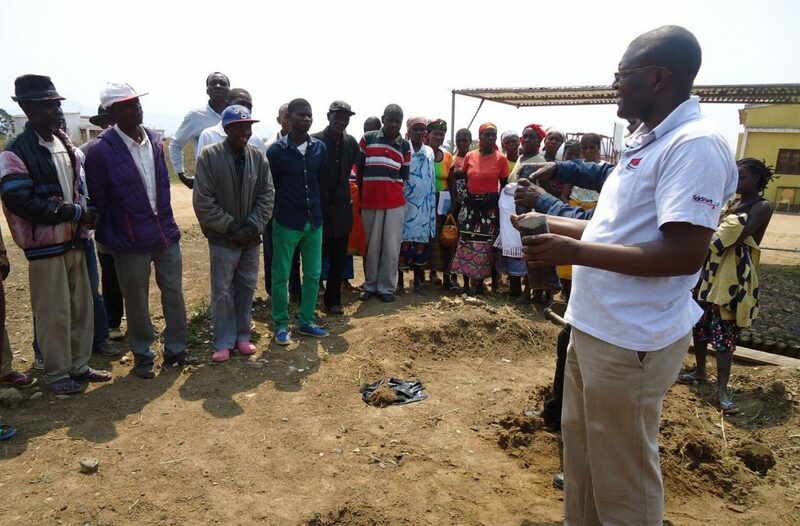 As KickStart’s Lead Agropreneurship Trainer, Denivas Onyancha traverses KickStart’s East, West, and Southern African hubs, building the capacity of individual farmers and the staff of partner groups to adopt and benefit from basic irrigation. Denivas uses a customizable Agropreneurship training curriculum to tailor each session to address the particular needs of his participants. He teaches farmers and fellow trainers how to properly use and maintain MoneyMaker irrigation pumps, efficiently manage water and soil, and approach farming as a business, among other skills. Denivas witnesses firsthand the enormous impacts of these trainings, and the increased benefits that farmers experience from learning how to take up irrigation. Denivas shared a few of his most memorable experiences in the field, which show how farmers are combating hunger and generating a lot more income after learning how to utilize available water resources. “We are not only encouraging small-scale irrigation, we are partnering with farmers to strengthen local food security, be more resilient to climate change, and gain stronger financial independence,” Denivas explains. One particular farmer in Uganda, Edmond Nyeko, made such an impression on Denivas that he now visits him frequently. After Edmond walked by one of Denivas’ field trainings, he stopped to listen and immediately started taking notes. Edmond was a teacher at the time, and also grew groundnuts on a small farm. After losing a large amount of money on his farm during a long dry spell, he was looking for a useful way to use the water that passes by his farm. Once he finished watching Denivas’ training, Edmond bought a pump and immediately got to work. Denivas was so impressed by his determination that, when he traveled back to Uganda a few months later, Denivas returned to visit Edmond- and found him busy. When asked, the farmer explained that he was “making money every day,” and he was proud of what he had accomplished already. In fact, Edmond was so successful that he left his teaching job to focus on farming. He can now pay his son’s school fees, which would not have been possible on his teaching salary alone. Edmond often lends his pump to neighbors, encouraging them to save their earnings and purchase their own MoneyMaker pumps. Denivas emphasizes that, in the rural communities in which KickStart works, agriculture has historically been seen as a means for people to feed themselves and their families, not as a business. Agropreneurship teaches farmers how to expand beyond that mindset and use irrigation as a tool to expand yields, crops, and income. Before coming to KickStart, Denivas had a long career in agronomy. He became inspired to join our team after he met a woman who became so successful from using a MoneyMaker pump that he invited her to tell her story at various forums. Denivas is determined to unleash the vast potential of Africa’s resources- not least of all, small-scale farmers themselves. His passion for imparting valuable farming knowledge is a critical asset for achieving KickStart’s ambitious goals of lifting another one million people out of poverty and catalyzing broad-scale irrigation interventions across the continent. Thanks to our partnership with the PIMCO Foundation, KickStart is expanding the reach of transformative agropreneurship trainings to more farmers, building their ability to turn small-scale farms into profitable businesses. The majority of farmers reached through agropreneurship trainings to date have been women. In partnership with the PIMCO Foundation, KickStart will continue to advance women’s empowerment and rural livelihoods by providing training to hundreds more farmers this year, helping to maximize the success of their hard work. Sander Pruijs, Head of Global & Rural Retail Clients at Rabobank, joined KickStart’s Board of Directors in November 2017. In his position at Rabobank, Sander is responsible for the rural banking businesses in Australia, New Zealand, Brazil, Chile, Peru, and North America, as well as for Rabobank N.A. in California (RNA) and Rabobank Indonesia. Mr. Pruijs holds a number of leadership roles at Rabobank including: Chairman of the Board for RNA; President Commissioner of the Board of Commissioners for Rabobank Indonesia, Member of the Board for Rabobank Australia, and Member of the Board for Rabobank New Zealand. This November, KickStart launched the powerful docudrama A Seed of Maize through premieres in New York and San Francisco. Created by Emmy award-winning director, Topaz Adizes, and award-winning producer, Ofir Kedar, the film transports audiences into rural Zambia and follows the young protagonist, Florence, and her family as they face the biggest dilemma of their lives. The film delves into the issues of girls’ education, poverty, and health, against the backdrop of tradition and community. KickStart was awarded a grant from the Flex Fund, a joint initiative by Skoll Foundation, Ford Foundation, and Doc Society, to harness the film’s message into change for more families. KickStart is now leveraging A Seed of Maize in our advocacy efforts around small-holder irrigation in Africa. At the end of last year, KickStart’s Director of Programs & Partnerships, John Kinaga, convened key stakeholders and NGO partners in Malawi for intimate screenings followed by discussion. Learn more about how KickStart makes an impact through storytelling in this feature by Zachary Slobig of Skoll Foundation. You can help KickStart make a sustainable difference in the lives of farmers by becoming a member of the Evergreen Circle! The Evergreen Circle is a community of active supporters who make an impact through making a recurring gift monthly, quarterly, or yearly. New members receive a special welcome package including a Kenyan bracelet. Become a member of the Evergreen Circle and empower farmers in Africa to change their lives. Join us in changing the way the world fights poverty!